Whose Buddies are the best! Join the Buddy Legend to Prove Yourself! During the match, players over Lv.120 can click to register for the contest according to their level. When the match starts, players above Lv. 120 can register manually for the knockout match before the deadline of registration. There are five groups in total and players will join the matches according to the level. The match is separated into two phases: Knockout Match and Promotion Match. Players need to choose 3 different buddies to join the match (Main Char cannot join the match). Each match is composed of 3 sets, in which only one buddy can go into battle for each set and the player that wins 2 sets shall stand out. A. Players are selected randomly to fight, with 10 mins interval between sets. B. Players losing 3 matches in total will be eliminated until the Top 32 are decided. The Top 32 will be divided into 16 groups to join the matches. Each match is composed of 3 sets with one hour interval between sets and the player that wins 2 sets shall stand out. When the Top 16 match starts, players can adjust the buddy sequence of the 2nd or 3rd setduring the interval between the 1st set and the 2nd set. 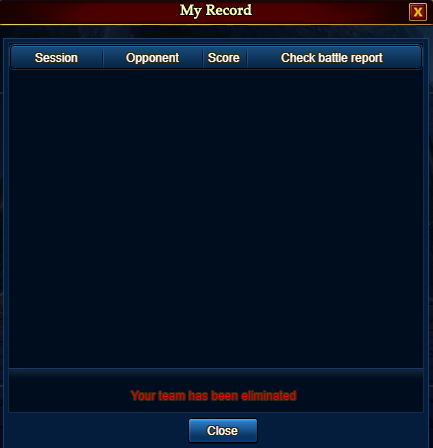 Players losing 1 match will be eliminated directly until the Champion stands out. 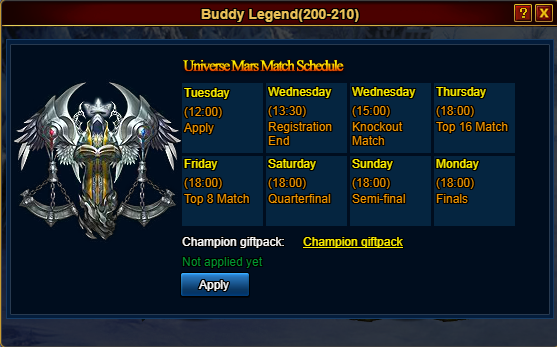 *The titles obtained in the matches are time-limited, but their bonus stats are permanent. 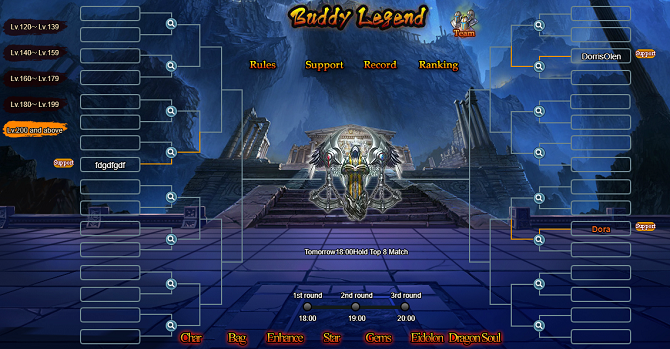 During the final match, players above Lv.120 may choose one to support in each round. If the one supported win the game, players will gain Silver as rewards. Otherwise, no rewards will be gained.